Home to around 91,800 residents in the Kansas City metro area, the remarkable city of Lee’s Summit, Missouri was named one of Missouri’s “Top 10 Happiest Places,” for good reason. This pedestrian friendly city is just minutes from all the great dining, shopping, entertainment and recreation Kansas City has to offer. Located in both Cass and Jackson counties, Lee’s Summit sits on 65.87 square miles southeast of K.C. 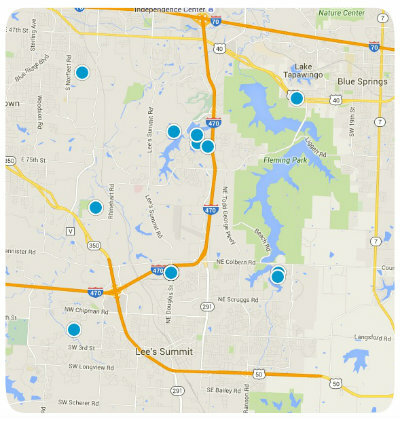 Residents of Lee’s Summit can travel with ease via M-150, M-291, I-450 and U.S. 50. And sports fans will be thrilled to know that both Kauffman Stadium, home to the Kansas City Royals, and Arrowhead Stadium, home to the Kansas City Chiefs, are both nearby. Sporting K.C. and the Kansas Speedway are also in close proximity. With all of these great amenities, it is no wonder Lee’s Summit is such a popular destination among prospective homebuyers. There are wonderful real estate options in diverse communities from golf, gated, master-planned communities to communities of condos, townhomes, single family and lakefront homes. One of Lee’s Summit’s most remarkable communities is that of Lakewood. Lakewood is a well-established, master-planned community built around a gorgeous 365 acre lake. The community lake affords residents the opportunity to sail, kayak or ride on their pontoon. There is a picturesque beach behind the main clubhouse so residents can also enjoy swimming. Lakewood is found off M0-291 near I-70 and is home to around 2,200 residents. This family-friendly neighborhood is served by the Lee’s Summit and Blue Springs School Districts which are both known to be top-notch. Homes for sale in Lakewood vary in price depending upon a number of factors including the property’s age, size, location, style and special features. The price range is broad, starting around $200,000 and reaching over $3 million. Buy a home in Lakewood and you’ll also get to enjoy the great shared amenities including 4 swimming pools, several parks, multiple sports courts, a sand volleyball area and a baseball field. If you would like more information regarding homes for sale in Lakewood, or if you have questions regarding other real estate options in Lee’s Summit, Missouri, please do not hesitate to contact us today.